Hancrafted and made fromupcycled materials. Designed and sewn in our Hochelaga(montréal) based studio. RITA bralette with no wire and no padding. The bra band is ajustable in the back. With its special front cut it offers a great definition of the bust, avoiding monoboob effect. Les Belles Bobettes creates unique styles with bold color combinations all made from upcycled, lost & found fabrics. Most of the fabric used are coton, polyester or blends. All elastic and lining are new. We use industrial coverstitch and overlock to insure durability and confort. 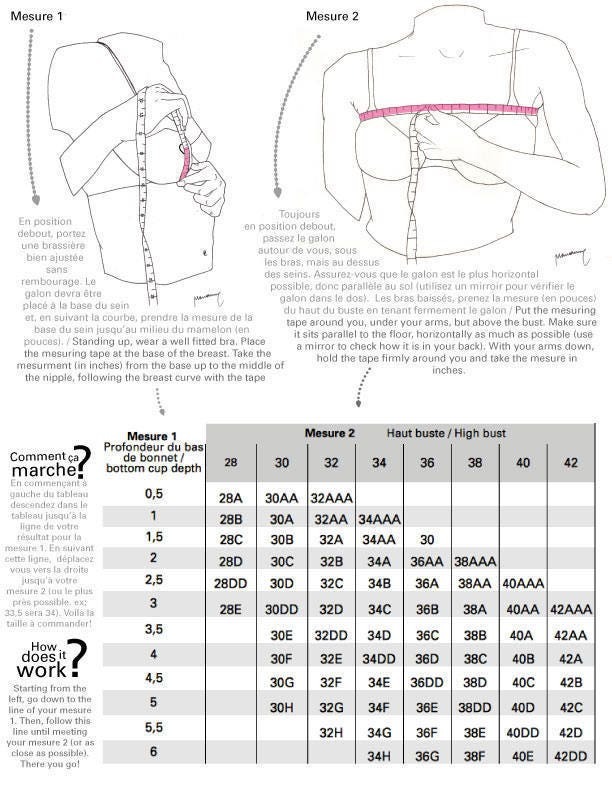 Please make sure to select the sppropriate size to get the best support for the breast. Each brand has it's own way of grading, make sure to read and follow the chart included in the picture above. Remember that the bra band support 80% of the breast weight. It is very important that it fits correctly to maximize support. If not fitted properly the weight of your breast will hang from your shoulder creating pain in back and shoulders. If you are unsure what size to take or hesitating between 2 sizes, please get in touch with me. I will help you choose the best one. Please send me mesures 1 and 2 plus a third mesurement of your rib cage (make sure to exhale completly before taking rib cage mesurement, with your arms down). If you are ordering from Montréal and want to pickup your order, please use promo code PICKUP to withdraw shipping fees and get in touch with our shop to schedule an appointment. It is your responsability to schedule the appointment for pickup. Les belles bobettes cannot be held responsable for item that have not get picked up.